Sunday night was a special night for the Wyoming Cowboy wrestling team. Their evolution under head coach Mark Branch took another step in their maturation. 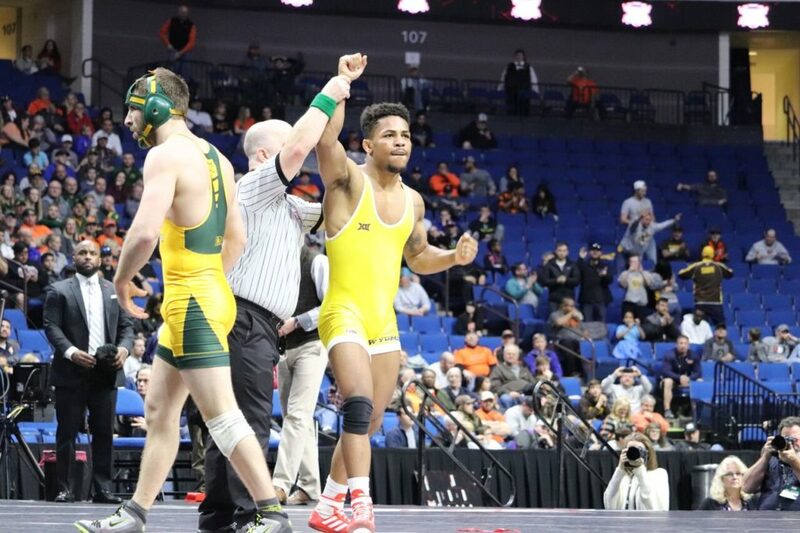 The Cowboys had two first place finishers in the Big 12 tournament on Sunday. Archie Colgan and Bryce Meredith became the first two Cowboys to win their respective weights in the Big 12 since the Cowboys joined the conference. Bryce Meredith was also named Most Outstanding Wrestler of the tournament. The Cowboys placed six wrestlers in the tournament. Five of them are guaranteed spots at the NCAA tournament in Cleveland in two weeks. In addition to Colgan and Meredith, Montorie Bridge placed third at 133 pounds, Sam Turner placed fourth at 149 pounds, Branson Ashworth finished third at 165 pounds, and Chaz Polson placed fifth at 184 pounds. Polson will have to wait until Tuesday to see if he’s earned a spot in the tournament when the at-large committee meets. The Cowboys for the tournament finished in fourth place with 82.5 points. Oklahoma State finished first with 137 points, followed by Northern Iowa and South Dakota State. This was the highest finish for the Cowboys in the Big 12 tournament. After being stymied by Dean Heil of Oklahoma State the previous two years Bryce Meredith got over the hump this season and has now beaten Heil twice. The first time beating him in Cheyenne, and now for the Big 12 championship. It would be hard to imagine a scenario where they would avoid each other in Cleveland in two weeks. The Cowboys will head to Cleveland for the NCAA tournament that takes place March 15 – March 17. Last season the Cowboys finished in 21st place. Last year’s champion was Penn State, followed by Ohio State and Oklahoma State.